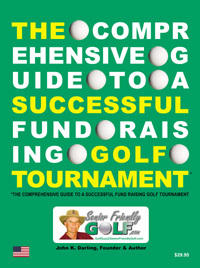 Outstanding book reviews that show why any charity or non-profit organization holding golf tournaments to raise money for their cause cannot be without The Comprehensive Guide to a Successful Fund Raising Golf Tournament publications. John K. Darling is a 1961 graduate of The University of Texas, Austin....... He is a golf writer and golf tournament consultant dedicated to helping charity and non-profit organizations succeed with their golf tournament and other fund raising events.......... He is also the author of the http://www.SeniorFriendlyGolf.com web site where there is a wealth of information and articles relating to golf.......... The web site is no longer just for seniors.